Hever Castle is an unforgettable private party venue. Whether you’re planning an anniversary celebration, a notable birthday or a ‘just because’ gathering of family and friends, Hever Castle offers a selection of beautiful venues to choose from. Whether it’s a small intimate gathering or a lavish party, let us create a lasting memory that will live on for many years to come. Guaranteeing unobtrusive service combined with first class comfort and cuisine, both lunch and dinner options are available, provided by award winning caterers Leith’s Dining. Perhaps combine your visit with a private guided tour of Hever Castle and for those who like to let their hair down, dancing can be arranged as dusk falls. Arrive in style to the castle forecourt and welcome your guests across the drawbridge to experience the splendour of the function rooms within Hever Castle. 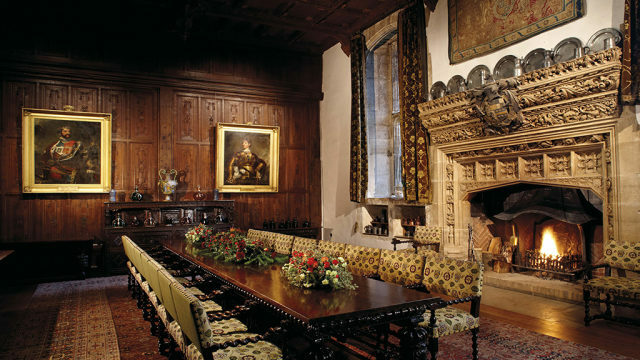 Offering panelling, carved columns and impressive fire places combined with a fine collection of paintings and antiques, Hever Castle is second to none when it comes to entertaining and provides a fantastic setting for a private party venue. Access for private events is available all year round for evening receptions and dinners from 6.30pm and for lunches on days when the castle is closed to the public. The castle is closed to the public throughout January and on Mondays and Tuesdays, November to February, excluding school holidays. The castle can accommodate up to 60 guests for a drinks reception in the Inner Hall and up to 40 guests in the Castle Dining Hall in a banqueting style table arrangement. A private guided tour can be arranged as part of your event allowing your guests to fully appreciate the history of Hever Castle and a selection of entertainment including a Tudor Minstrel in traditional costume with an array of beautiful period instruments can also be organised. A facility for dancing for up to 120 can be arranged in The Moat House, a short stroll via The Drawbridge from the castle. The Astor Wing, created in Tudor style is a private Edwardian Wing attached to Hever Castle, taking on the appearance of a Tudor Village. Arrive to the private gated entrance and enjoy the comfort and country house charm of this historic venue. Within the Astor Wing there are three interconnecting, beautifully appointed function rooms that make up the Tudor Suite. Surrounded by the formal Tudor Suite lawns there is a picturesque outside terrace area for drinks receptions overlooking the castle. The Tudor Suite can accommodate up to 60 guests for lunch gatherings or dinners. After your event, relax in the comfy sofas of The Music Room or challenge your guests to a game of billiards in the Billiards Room. Exclusive use and upgrades to combine the Castle in conjunction with an Astor Wing event can be arranged subject to availability. A private guided tour of Hever Castle can be organised as part of your event, allowing your guests to fully appreciate the history of Hever Castle. A selection of entertainment, including a Tudor Minstrel in traditional costume with an array of beautiful period instruments, can also be arranged. A facility for dancing for up to 120 can be arranged in The Moat Restaurant a short stroll from The Astor Wing. The Guthrie Pavilion at Hever Castle offers a stunning waterside location in the award winning Italian Gardens. Surrounded by the Rose Gardens, The Guthrie Pavilion can be hired in conjunction with The Loggia which overlooks our 38 acre lake and boasts its own Trevi inspired fountain, making it a truly unique private party venue. The Guthrie Pavilion has been extensively refurbished in Palladian style with high vaulted ceilings and columns from floor to ceiling to reflect the style of the Italian Gardens. During the spring and summer months this striking setting really comes into its own, with drinks and canapés being served on the Italian Loggia as long balmy evenings are filled with the scents of a multitude of floral blooms. Drinks receptions on The Loggia can accommodate up to 180 guests and can commence from 6.30pm. A short walk via Pergola Walk, bedecked with an array of camellia, will bring your guests to The Guthrie Pavilion where they will be seated for dinner. Seating is on round tables for between 100 and 200 guests. Alternatively, informal buffets and barbeques are available. Finish your evening with dancing and fireworks over the lake to create a lasting memory of your time at Hever. There are 28 stunning bedrooms at Hever Castle, recently refurbished and fit for a King, graded five stars by Quality in Tourism. Expect period colours, panelled walls and vaulted ceilings. Several rooms boast four posted beds and roll top baths. All offer luxury, antique furnishings and rich fabrics. Some rooms have stunning views across the formal lawns of The Astor Wing, others across the apple orchard to the castle. All are en suite with period features combined with modern day luxury. Your total professionalism and efficiency made this special occasion go without a hitch; Mark was completely overwhelmed with his surprise, and so he will take away many wonderful memories of his half-century birthday celebrated at Hever Castle ... in his own words "I never dreamt …!" This is just a note to thank you and all the staff at Hever for making sure we and our guests had such a wonderful and magical two days to celebrate our Golden Wedding. We have been inundated with letters from our guests expressing their amazement at the whole experience. Several start with “there are no words to describe how fantastic the whole occasion was” and many could not believe the detail that had gone into everything. Some of the guests are used to staying in some of the best hotels in the world, so this is high praise indeed. Please pass our comments and thanks to the staff, who all helped to make the occasion so special – we might be back for our 60th!! Dear Emily / Faye, I just wanted to say an enormous THANK YOU for all your hard work, planning and support these last few months. Saturday exceeded all my expectations and it was a truly magical weekend. The venue, the food, the service, the rooms - it was all impeccable and I cannot thank Hever enough.Please also pass on a big thank you to Paul, who was just brilliant, the lovely man on the door whose name escapes me, the chef (food was superb) and all the other staff. We were so very well looked after. I cannot think I will ever have another birthday as special as that one. A dose of post-birthday blues today! On November 3rd, 2018, I had the pleasure of entertaining 28 good friends to dinner at Hever Castle, with overnight accommodation in the Astor Wing. It was a truly wonderful event. The Hever setting was unequalled, the food was superb, and the service could not have been better. Even the weather did its very best for us! My guests were extremely happy - several of them said it was the best weekend they had ever had! Now we're looking for a good excuse to do it all again!" Emma and I can hardly find the words ! Yesterday’s party was not just another good party but it was outstanding. Roland was absolutely brilliant, the food was exceptional (the lamb,especially, could not have been cooked better). The whole meal was delicious. The service was superb, and the staff were lovely, always smiling. We had the most wonderful day, and each one of our guests said that it was one of the best parties that they had ever been too. The Red Arrows paid us a visit and then waited till we got home before flying low over our house. I cannot thank you and all your team enough for the complete organisation of the party. The whole day was fabulous. We will of course be in touch as soon as we have the pictures and would love to come down to see you then. On behalf of the Briggs family please pass on our huge thanks to you and all of the team at Hever that looked after us so splendidly on Saturday for our mother’s 90th birthday celebrations.